Mrs. Russell Barrington (Emilie Isabel Wilson Barrington), The Life, Letters and Work of Frederic Baron Leighton of Stetton, vol. 2, New York: The Macmillan Company, 1906, pp. 245-247. Note: Mrs. Barrington is mistaken in dating this speech to the 50th anniversary of Joachim’s English début. 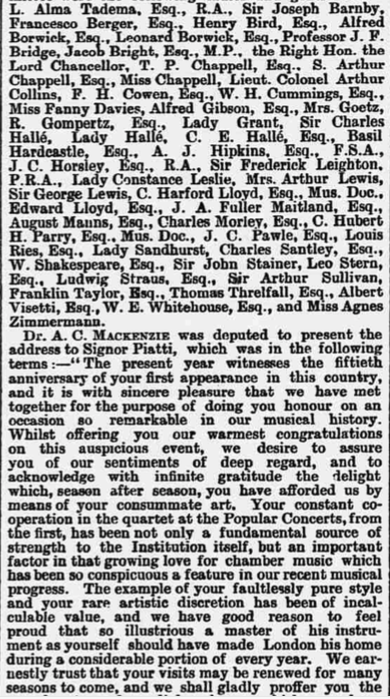 The speech was given in St. James’s Hall, London, on April 15, 1889, to commemorate the 50th anniversary of Joachim’s début in Pest (see articles below). LADIES AND GENTLEMEN,— It was necessary that the motives and feelings which have drawn us together to-night should find brief expression on somebody’s lips; and, in obedience to a command which has been laid on me by this Committee, I have to ask you to accept me, for a few moments, as your mouthpiece. Of the varied duties which life lays on us, there are some which we perform in simple discharge of conscience and with little joy; some, if few, into the discharge of which we can pour all our hearts; and such a duty is this which I have risen to perform. I have said that I shall only ask your attention for a few moments, and you will feel with me the fitness of brevity; for besides that, in every case, taste imposes restraint in praise of those who are present before us, long drawn and redundant eulogy would clash strangely with that rare simplicity which is one of the qualities by which Joachim, the Man, compels the esteem of all whose fortune it is to know him. But there would be in it, I think, also a further deeper-lying incongruity, for we know that Joachim, the Artist, has risen to the heights he occupies, perhaps alone, by fixing his constant gaze on high ideals, and lifting and sustaining his mind in a region above the shifting fickle atmosphere of praise or blame. Well, it is now fifty years since he took his first step along the upward path, which he has trodden in wholeness of heart and singleness of purpose from earliest boyhood to mellow middle age. During these fifty years he has not only ripened to the full his splendid gifts as an interpreter, ever interpreting the noblest works in the noblest manner, leading his hearers to their better comprehension; not only marked his place in the front ranks of living composers by works of instinct with fire and imagination ; but shown us also, as a man, how much high gifts are enhanced by modesty, and how good a thing to see is the life of an Artist who has never paltered with the dignity of his Art. Deep appreciation of these titles to respect and admiration has, as you know, led in Germany, the country of his adoption and his home, to an enthusiastic celebration of this, the fiftieth year of his artistic career; and we, his English friends, living in a country which we hope, nay, believe, is, after his own, not the least dear to him, have felt strongly impelled to express to him also in some form our gratitude, our sympathy, and our esteem. It has seemed to your Committee that these sentiments could not take a more fitting outward shape than that of the instrument over which he is lord: such an instrument, signed with the famous name of Stradivarius, and, as I am told, not unworthy of his fame, flanked with a bow the work of Tourte, and once the property of Kiesenwetter [sic] — such a fiddle and such a bow I now offer to him in your name. Its sensitive and well-seasoned shell will acknowledge and respond to the hand of the master, and the soul of many great musicians will, we hope, often speak through it to spellbound hearers. But we nourish another hope — the hope that, through the great waves of melody that shall roll forth from it under his compelling bow, a still small voice may now and again be interfused which, reaching his heart through his ears, shall speak to it of the many friends who, in spirit or in the body, are gathered round him affectionately to-night. THE LAST MONDAY POPULAR CONCERT. An enthusiastic audience assembled last night in St. James’s Hall on the occasion of the last Popular Concert. As is the custom, the program was longer and more varied than usual, and included the usual string quartet, MM. Joachim, Reis [sic], Straus, and Piatti, Miss Liza Lehmann as vocalist, and Miss Fanny Davies, Mdlle. Janotha, and Miss Agnes Zimmermann at the pianoforte. Naturally, on such an occasion the appearance of Dr. Joachim was the most looked for, and when the eminent violinist ascended the platform he was greeted with round after round of applause. The enthusiasm of the audience rose to its highest pitch after his playing of the piquant and delightfully vivacious Brahms-Joachim Hungarian dances, Nos. 11, 15, and 1, in conjunction with Mdlle. Janotha. First Herr Joachim returned amid the thunders of applause hand in hand with the pianist; then he reappeared violin in hand; again without his violin. Now we can see him parleying in the background with Mr. Chapell; and at length he re-enters, leading Mdlle. Janotha by the hand, and plays yet another of these delightful dances. The honors of the evening were shared by Miss Liza Lehmann, who was dressed charmingly in a low-cut silk robe of diaphanous green, gold spangled, with just a suggestion of pearly pink at her throat, and carrying a bouquet of Baroness Rothschild roses. Her selection of songs included an old English ballad, “Oh, listen to the voice of Love,” which made us wonder why we always — or nearly always — go abroad for our music. Signor Piatti came in for a large share of applause upon his appearance with Miss Fanny Davies to play Veracini’s — (the arrogant, capricious capo pazzo) — Largo and Allegro, which was introduced to the English public eighteen years ago. Miss Fanny Davies and the popular quartet played with some spirit of the contagious enthusiasm of the evening. Presently the small stage is occupied by a select few, and it is curious to see Mr. Alma Tadema taking the place of a “corner man” opposite to Mr. Hichens. Sir Frederick Leighton is sitting in the seat of the interlocutor, and around him are Dr. Joachim, Herr Reis [sic], and Herr Straus, with Signor Piatti in the back-ground, and Dr. Mackenzie, Mr. Fuller Maitland, and W. G. Cusins, and Mrs. Alma Tadema. 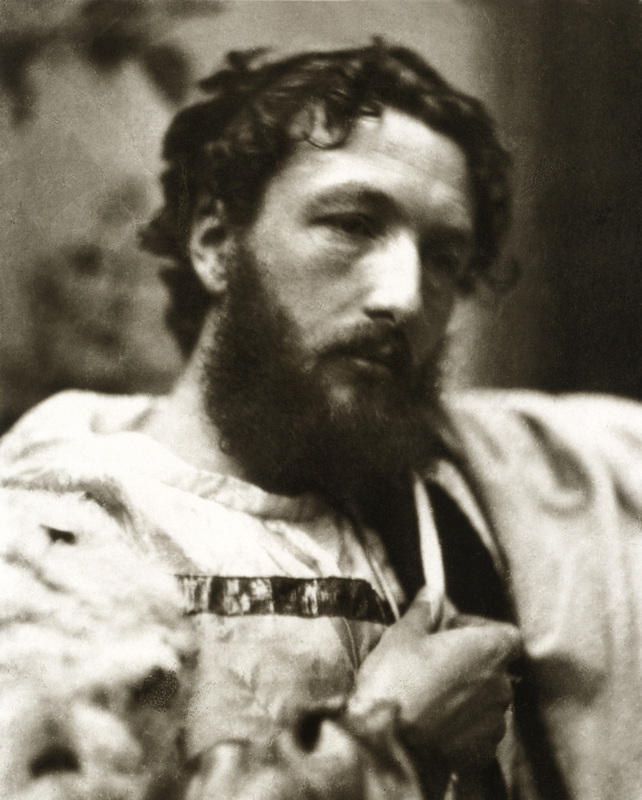 Then Sir Frederick Leighton rises, and says that it is a duty untouched with care to thus pour out our hearts in honour of one so well-esteemed. We shall feel with him the fitness of brevity. Long-drawn eulogy would be ill-becoming and not in keeping with the simplicity of Joseph Joachim, the artist who had reached the summit of his ambition by fixing his gaze on high ideals. It is now fifty years since Dr. Joachim took the first step which has led him upwards from early boyhood to mellow age. He is an interpreter of the noblest things in the noblest manner. Not only did he stand unchallenged as a great interpreter, but, showing us also a composer of rare powers, we found in him that the highest gifts are ever accompanied by the truest modesty. His many lovable qualities had led to the recent enthusiastic recognition of his powers in Germany, and now we were striving to give some fitting outward sign of our appreciation. The sensitive and well-seasoned shell would at once respond to the touch of the musician, and would now and again conjure up the still small voice of his English friends who, either in spirit or in the body, were gathered round him to-night to do him honour. Some mistake has been made in the reports of the presentation of the precious fiddle to Dr. Joachim on the attainment of his fiftieth year as a public performer of high-class music. To say that it was done “at the close of the last Monday’s popular concert” is not sufficient information, for the presentation was of a semi-private character, and not made before the audience in St. James’s Hall, as had been all along anticipated. 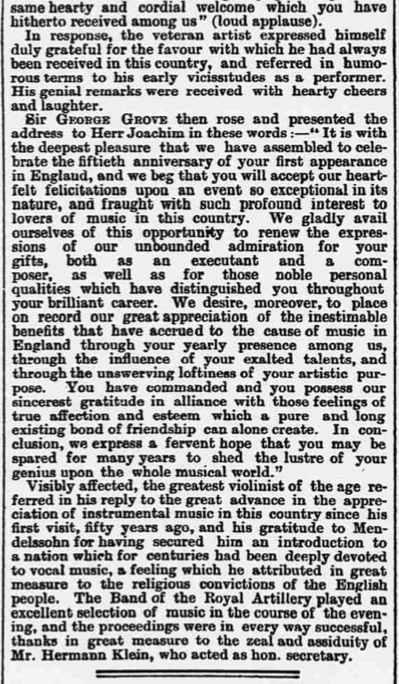 The concert being the last of the series, and the nature of the intended ceremony being much talked of, the hall was crowded, and deep was the disappointment of the people present when it became known that the testimonial would be given to the eminent recipient in the lower hall after the concert. It is only fair to add that this procedure was decided upon at Joachim’s own request. 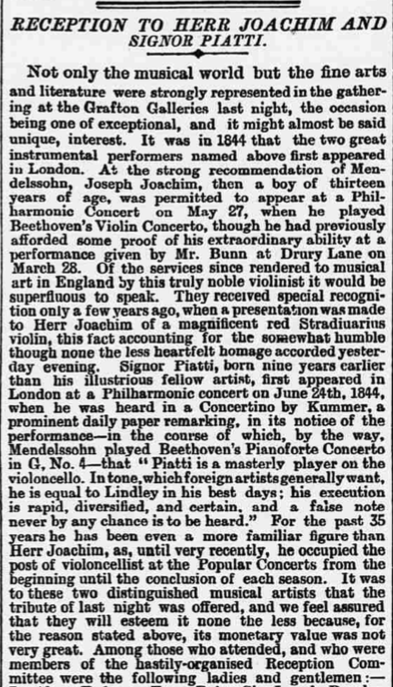 The ordinary reader may be pardoned for surprise on learning that this violin was worth, and had indeed cost over £1500, but the connoisseur in such wares will only regard this as a fair figure when told that the instrument was one of the most famous productions of the most famous Stradivarius. The case bears the embroidered quotation “From beneath his hands a crash of mighty sounds rushed up, whose music shook the soul with sweetness” — a sort of contradiction in terms, I fancy, to any but the very select. Sweetness is no doubt generally the attribute of a note from a violin by this Cremona artist; “a crash of mighty sounds” is good as an excusable figure of speech only. However, Herr Joachim quite deserved this valuable present from his many admirers, and has earned all the nice things said by him and to him by the courtly Sir F. Leighton.